RHPC Board President Celebrates a Birthday!! 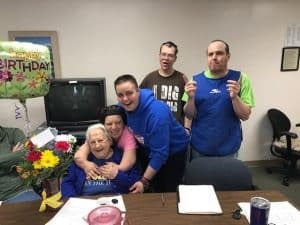 On Monday, May 21st, Rolling Hills Progress Center celebrated board president June Kingery’s birthday by presenting her with flowers, a balloon, and a very special rendition of “Happy Birthday” from a handful of clients. June has been a part of Rolling Hills Progress Center for over 35 years and her continued support is greatly appreciated! Thank you June!! !